Jane Davenport was a first time Feature Stall at our Sydney AW15 market last weekend, and based on our instagram posts of her stall, we know you love her work! 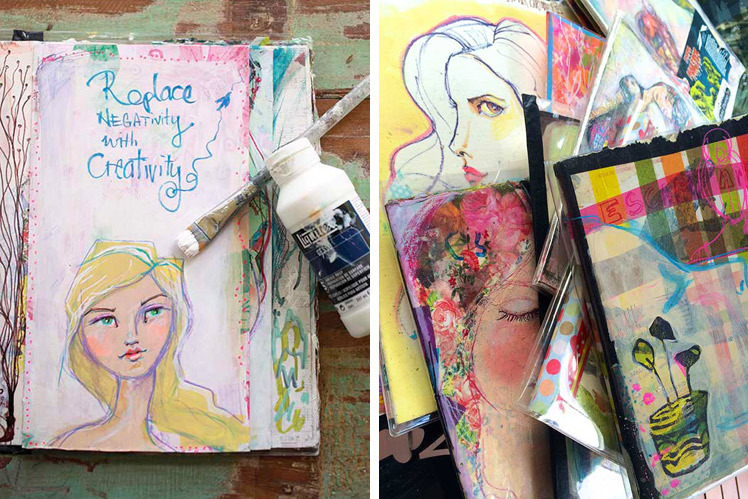 Today we chat with Jane about her creative background and what informs her artistic practice. Girls’ faces feature strongly in my whimsical work, often with somewhat wistful or melancholy expressions, surrounded by interacting colour. Sometimes people tell me they look sad, but to me they are thoughtful and calm. I like to capture people as they are pondering. I started my creative career as a fashion illustrator and the evidence of my Parisian training lingers in the elongated figures I like to capture. I like to make random backgrounds out of left over paint and paper. There is always a juicy starting point there. I also love creating in journals. That way, if something isn’t ‘gelling’ in the moment, I can just flip the page and start afresh, or work on something in progress. It keeps me in the moment and the creative wheels spinning. I love working on large canvases too, but there is something about awesome paper that sets me free. 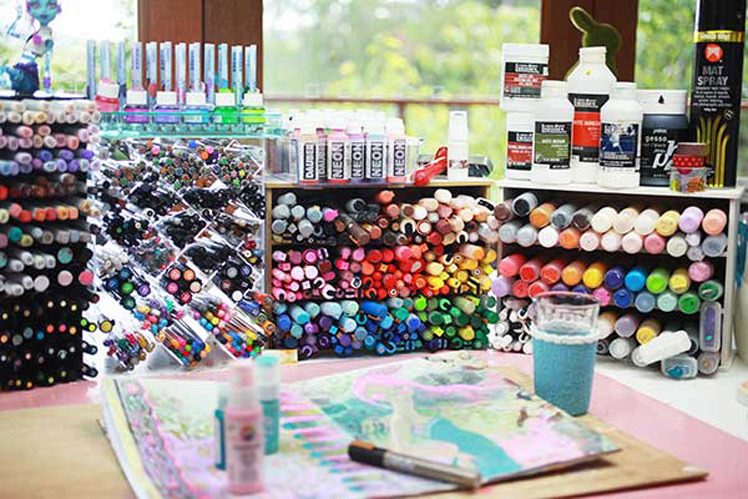 I have rainbowitis and am an avid (rampant) collector of art supplies. So I like to use everything. But lately I have been going into complete conniptions over watercolour. It electrocutes me with the way it does it’s own thing. 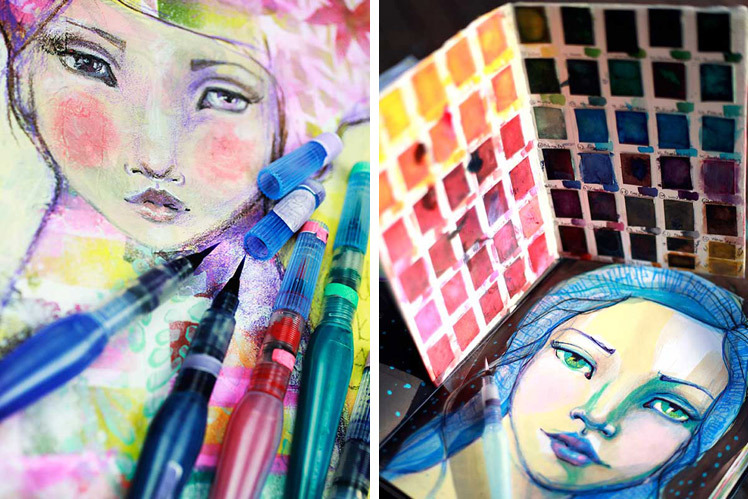 As the artist, the watercolour and I work in cahoots, but I feel like it’s a free agent. My workspace is delightful quite frankly. 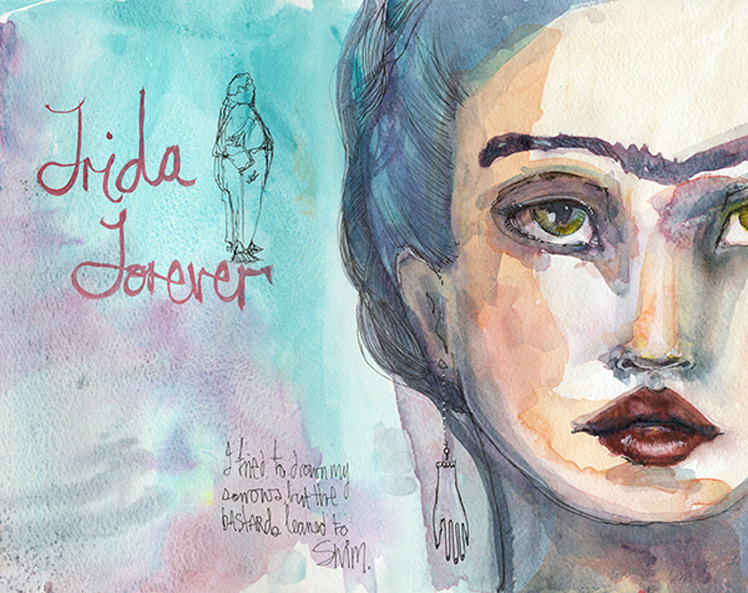 I not only have all my artist materials surrounding me, but my shrine to Frida Kahlo and lots of artwork I have collected from artist friends, so wherever I look, there is something amazing happening. My creative process is quite relaxed. I sit in my funky little sewing chair and hours and hours later, I emerge from my art trance. My process goes like this: “joy, joy, destroy, joy, joy, destroy” and so on, until I don’t feel like changing things up any more. Then it’s done. Make lots of art. Lots. Learn how to read and understand a contract. My direction for the future is to keep on my current trajectory. It’s pretty cool. 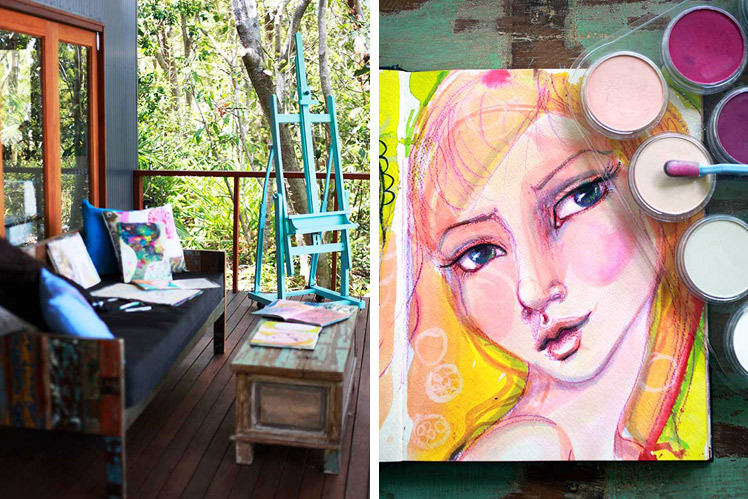 I travel all over the world hosting amazing retreats with other artists. 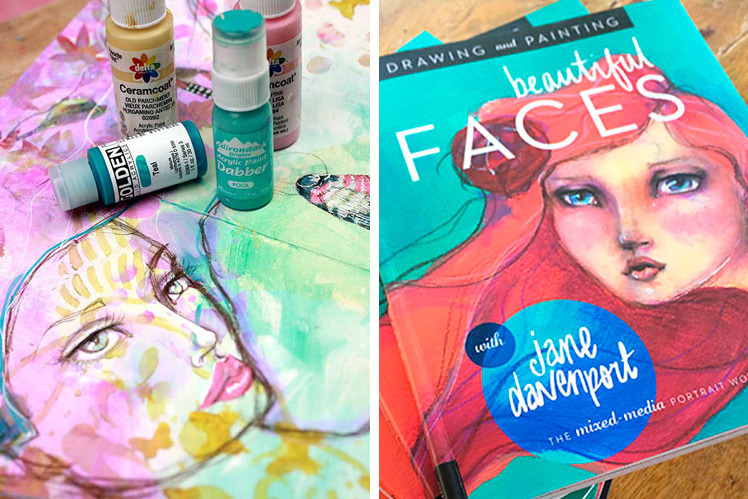 My brand new book, ‘Drawing & Painting Beautiful Faces’ is a #1 best seller in the USA I have an online Art School and teach thousands of people to make art and get more creative. I live overlooking Byron Bay with my favourite peeps. 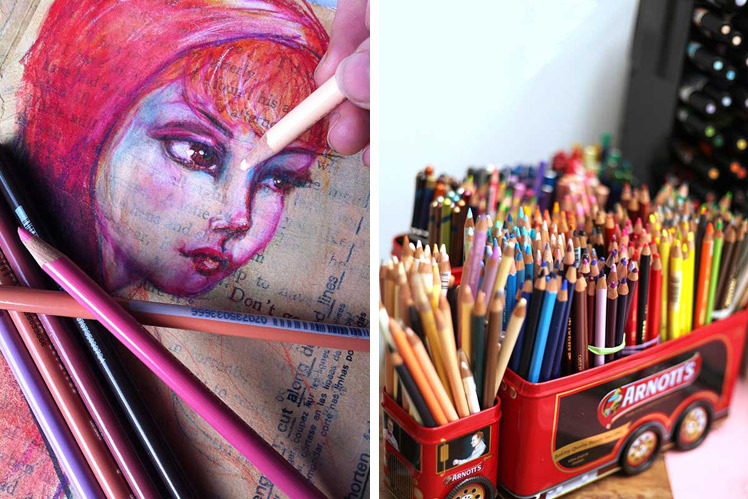 All I need to add is designing more of my own art supply products. I have some ideas that need to come to fruition!